Schluter®-KERDI Flange Kits contain a drain, and an integrated bonding flange that provides a large contact area for a secure connection to the load-bearing bonded waterproofing membrane at the top of the assembly. Just adhere the waterproofing membrane to the large integrated bonding flange to form a waterproof connection at the top of the drain assembly. Great for use with Schluter-KERDI waterproofing membrane. Kits are available with either 2" drain outlets or 3" drain outlet in ABS, PVC or stainless steel. Two inch stainless steel flanges are available with either a no-hub outlet or a threaded outlet. Three inch stainless steel models have a no-hub outlet. ABS and PVC flange kits include a drain with an integrated flange. 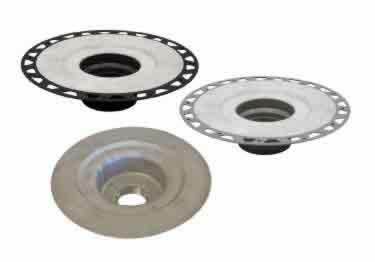 Stainless steel flange kits include a drain, integrated flange and KERDI-FIX sealing and bonding compound (100ml). Note: Flanges with 3" outlets are intended for use with 6" grates as these combinations have listings and certifications while flanges with 3" outlets combined with 4" grates do not. See Listings and Certifications Chart for more information. Koffler also sells Schluter-DRAIN-KITS and Grate Kits, and Schluter-KERDI waterproofing membrane. Schluter®-KERDI Flange Kits contain a drain, and an integrated bonding flange that provides a large contact area for a secure connection to the load-bearing bonded waterproofing membrane at the top of the assembly. Just adhere the waterproofing membrane to the large integrated bonding flange to form a waterproof connection at the top of the drain assembly. The flange was the easiest part of the Schluter Kerdi install. It was easy to set the height and glue. No mess and no fuss. Thank you for your review. We appreciate your feedback concerning the ease of installation and of course with "no fuss."